Fergusonite: Mineral information, data and localities. Fergusonite is one of the species groups or series that was originally described as a single species, based on the standards of the time. Subsequently, with the advancement of science, several separate species were defined (Y-, Ce- and Nd-dominant). This file covers the data when all were one, simply "fergusonite." Monoclinic dimorphs are summarised under the name "β-Fergusonite". Zircon 4 photos of Fergusonite associated with Zircon on mindat.org. Microcline 1 photo of Fergusonite associated with Microcline on mindat.org. Monazite 1 photo of Fergusonite associated with Monazite on mindat.org. Pyrite 1 photo of Fergusonite associated with Pyrite on mindat.org. Marcasite 1 photo of Fergusonite associated with Marcasite on mindat.org. Arsenopyrite 1 photo of Fergusonite associated with Arsenopyrite on mindat.org. Haidinger (1826) Royal Society of Edinburgh, Transactions: 10: 274. Forbes (1855) Edinburgh New Phil. Journal: 1: 67. Forbes and Dahll (1855) Nyt Magazine: : 227. Forbes (1857) Phil. Magazine: 13: 91. Kôzu and Masuda (1926) Sc. Rep. Tohoku University, ser. III: 3: 1. Barth, T. (1927) The structure of synthetic, metamict, and recrystallized fergusonite. Norsk Geologisk Tidsskrift, 9: 23-36. Machatschki (1929) Zs. Kr. : 72: 291. Palache, Charles, Harry Berman & Clifford Frondel (1944) The System of Mineralogy of James Dwight Dana and Edward Salisbury Dana Yale University 1837-1892, Volume I: Elements, Sulfides, Sulfosalts, Oxides. John Wiley and Sons, Inc., New York. 7th edition, revised and enlarged: 757-763. 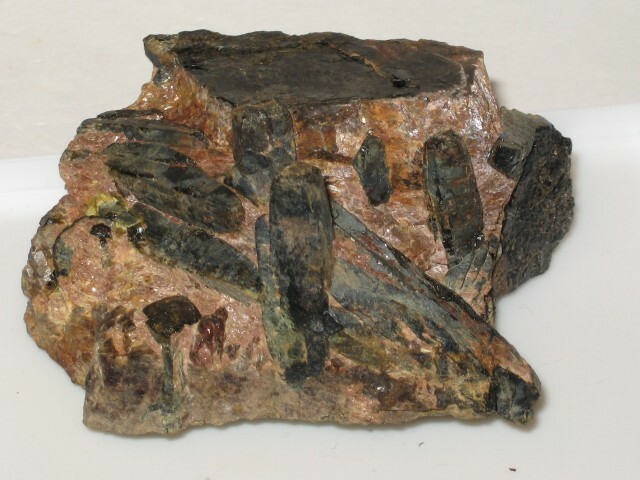 The following Fergusonite specimens are currently listed for sale on minfind.com. [Fergusonite-(Ce)] Hadj-Kaddour, Z., Liegeois, J. P., Demaiffe, D., & Caby, R. (1998). The alkaline–peralkaline granitic post-collisional Tin Zebane dyke swarm (Pan-African Tuareg shield, Algeria): prevalent mantle signature and late agpaitic differentiation. Lithos, 45(1), 223-243. Fernando Colombo, Raúl Lirai,María Sol O´Leary y Colombo C. G. Tassinari (2010): Los diques comendíticos de Papachacra (Catamarca): magmatismo peralcalino en sierras Pampeanas orientales. Rev. Asoc. Geol. Argent. 66 (1-2). Buenos Aires ene./mar. 2010. [Fergusonite-(Y)] Calderwood, M.A., Grguric;, B.A., Jacobson, M.I., (2007): Guidebook to the Pegmatites of Western Australia; Hesperian Press, Perth, 2007.
ⓘ Semmering basis tunnel ? [Fergusonite-(Y)] Kolitsch, U., Auer, C., Schachinger, T., Slama, M. (2018): 2093) Aeschynit-(Y), Allanit-(Ce), Ankerit, Ankylith-(Ce), Bastnäsit-(Ce), Cassiterit, Cubanit, Fergusonit-(Y) (? ), Hingganit-(Y), Ilmenit, Rutil, Synchisit-(Y), Synchisit-(Ce), Thorit, Xenotim-(Y) und Zirkon vom niederösterreichischen Anteil des Semmering-Basistunnels, Niederösterreich. Pp. 231-236 in Walter, F. et al. (2018): Neue Mineralfunde aus Österreich LXVII. Carinthia II, 208./128., 185-254. [Fergusonite-(Y)] Folie, K., Rocchetti, I. (1999): Novità Mineralogiche del Passo di Vizze. Rivista Mineralogica Italiana, 4/1999, 222-230. Ahlfeld, F. and Schneider-Scherbina, A. (1964) Los Yacimientos Minerales y de Hidrocarburos de Bolivia. Boletín No. 5 (especial), Ministerio de Minas y Petroleo, La Paz. [Fergusonite-(Y)] SHEARD, E.R., WILLIAMS-JONES, A.E., HEILIGMANN, M., PEDERSON, C. AND TRUEMAN, D.L. (2012) Controls on the concentration of zirconium, niobium, and the rare earth elements in the Thor Lake rare metal deposit, Northwest Territories, Canada. Economic Geology, 107(1), 81-104. [Fergusonite-(Y)] Williams-Jones, A.E., Heiligmann, M., Sheard, E., Macwilliam, K., Pedersen, C.J., Mercer, W., and Trueman, D (2010) The Nechalacho Heavy Rare Earth And Rare Metal Deposit, Thor Lake, Northwest Territories, Canada. Geological Society of America Abstracts with Programs, Vol. 42, No. 5, p. 335; Emma R. Sheard, Anthony E. Williams-Jones, Martin Heiligmann, Chris Pederson and David L. Trueman (2012) Controls on the concentration of zirconium, niobium, and the rare earth elements in the Thor Lake rare metal deposit, Northwest Territories, Canada. Economic Geology and the Bulletin of the Society of Economic Geologists(January 2012), 107(1):81-104; D. Robert Pinckston, Dorian G. W. Smith (1995) Mineralogy of the Lake zone, Thor Lake rare-metals deposit, N.W.T., Canada. Canadian Journal of Earth Sciences, 32:516-532; SHEARD, E.R., WILLIAMS-JONES, A.E., HEILIGMANN, M., PEDERSON, C. AND TRUEMAN, D.L. (2012) Controls on the concentration of zirconium, niobium, and the rare earth elements in the Thor Lake rare metal deposit, Northwest Territories, Canada. Economic Geology, 107(1), 81-104. [Fergusonite-(Ce)] G. Pouliot, J. A. Maxwell, and S. C. Robinson (1964): Cenosite from Bancroft, Ontario. Canadian Mineralogist 8, 1-10. OGS Doc MDC014.pdf - (Ontario Columbium (Nobium) Deposits 1971) Stewart A. Ferguson, p. 57.
ⓘ McKenzie Lake Mine (Gunter Quarry) ? ⓘ Maisonneuve mine (Maison Neuve mine) ? Palache, C., Berman, H. & Frondel, C. (1944), The System of Mineralogy of James Dwight Dana and Edward Salisbury Dana, Yale University 1837-1892, 7th. edition, Volume I: 799; Sabina, A.P. (1983) Rocks & Minerals for the collector; Kingston, Ontario to Lac St-Jean, Quebec. GSC Misc. Report 32, 65-66 p.
[Fergusonite-(Ce)] YAKOVLEVA, O.S., PEKOV, I.V., HORVÁTH, L., BRYZGALOV, I.A., YAPASKURT, V.O., and GUSEVA, E.V. (2010b) Mineralogy, geochemistry and genesis of high-alumina fenites of the Mont Saint-Hilaire alkaline pluton, Québec, Canada. Geology of Ore Deposits, 52, 795-805. [Fergusonite-(Y)] Hilderley, M., Ercit, T.S., Rowe, R.A. (2006) 33rd Rochester Mineralogical Symposium, abstracts, 13-14. [Fergusonite-(Y)] Zhiwei Bao and Zhenhua Zhao (2008): Ore Geology Reviews 33, 519-535. [Fergusonite-(Ce)] Zhang Peishan, Yang Zhuming, Tao Kejie, and Yang Xueming (1996): "Mineralogy and Geology of Rare Earths in China", Science Press (Beijing), 226 pp. [Fergusonite-(Y)] Rucheng Wang, Fontan, F., Xiaoming Chen, Huan Hu, Changshi Liu, Shijin Xu, and de Parseval, P. (2003): Canadian Mineralogist 41, 727-748. Zhiwei Bao and Zhenhua Zhao (2008): Ore Geology Reviews 33, 519-535. [Fergusonite-(Y)] Zhang Peishan, Yang Zhuming, Tao Kejie, and Yang Xueming (1996): "Mineralogy and Geology of Rare Earths in China", Science Press (Beijing), 226 pp. [Fergusonite-(Y)] Škoda, R., Novák, M., Houzar, S.: Granitické NYF pegmatity třebíčského plutonu. Acta Musei Moraviae, Scientiae geologicae, 2006, roč. 91, s. 129 - 176. [Fergusonite-(Y)] Tuisku, Pekka 2010. Heavy minerals from gold sluicing in Lapland Gold Rush area and their bearing on the origin of gold bearing tills. Res Terrae, Ser A, N:o 31. Proceedings of the Nordic Mineralogical Network V annual Meeting. Bull. Soc. Franç. Minéralo. Cristallo. , 1964, LXXXVII, p. 625-626. [Fergusonite-(Y)] MONCHOUX P., FONTAN F., DE PARSEVAL P., MARTIN R. F., WANG R. C. (2006) - Igneous albitite dikes in orogenic lherzolithes, Western Pyrénées, France: A possible source for corundum and alkali feldspar xenocrysts in basaltic terranes. I. Mineralogical Asssociations. The Canadian Mineralogist, Vol. 44, pp. 817-842. [Fergusonite-(Y)] Piccoli, G.C., Maletto, G., Bosio, P., Lombardo, B. (2007): MInerali del Piemonte e della Valle d'Aosta. Associazione Amici del Museo "F. Eusebio" Alba, Ed., Alba (Cuneo) 607 pp. [Fergusonite-(Y)] Balestra, C., Ciriotti, M.E., Bracco, R. (2011): Su alcune novità mineralogiche liguri caratterizzate dal SIUK dell'AMI. MICRO, 2011, 46-53. [Fergusonite-(Y)] - Finello, G., Ambrino, P., Kolitsch, U., Ciriotti, M.E., Blaß, G., Bracco, R. (2007): I minerali della “Pietra di Luserna”, Piemonte, Italia nord-occidentale. I. Alcune cave di gneiss della Val Luserna. Micro (località), 2/2007, 181-226. [Fergusonite-(Y)] Preite, D., Mattioli, V., Cini, V., Besana, G. (1997): Die mineralien von Beura und Villadossola (NO), Oberitalien. Lapis, 5/1997, 13-26. [Fergusonite-(Y)] Vecchi, F., Rocchetti, I. & Gentile, P. (2013): Die Mineralien des Granits von Predazzo, Provinz Trient, Italien. Mineralien-Welt, 24(6), 98-117 (in German). Daisuke Nishio-hamane, Tetsuo Minakawa, Yukikazu Ohgoshi (2013) Takanawaite-(Y), a new mineral of the M-type polymorph with Y(Ta,Nb)O4 from Takanawa Mountain, Ehime Prefecture, Japan. Journal of Mineralogical and Petrological Sciences 108:335-344. [Fergusonite-(Y)] Matsubara, S., Miyawaki, R., Yokoyama, K., Momma, K., Shigeoka, M., and Hashimoto, E. (2013) Pyrochlore and microlite in a pegmatite at Atagoyama, Koriyama City, Fukushima Prefecture, Japan. Bulletin of the National Museum of Nature and Science, Ser. C, 39, 1–6. Hasegawa, S. (1961) Chemical compositions of allanite, fergusonite and monazite from the Ushiroda pegmatite, Ishikawa town, Fukushima Prefecture. Journal of the Japanese Association Mineral. Petrol., Economic Geol. : 46: 57-61 (in Japanese). [Fergusonite-(Y)] Sueno, S., Matsuura, S., Bunno, M., & Kurosawa, M. (2002). Occurrence and crystal chemical features of protoferro-anthophyllite and protomangano-ferro-anthophyllite from Cheyenne Canyon and Cheyenne Mountain, USA and Hirukawa-mura, Suisho-yama, and Yokone-yama, Japan. Journal of mineralogical and petrological sciences, 97(4), 127-136; Kotaro Watanabe specimens. Endo, S. (2007) Chigaku Kenkyu, 56, #1, 17-23. [Fergusonite-(Y)] Okada, T. (2011) Hellandite from Mt. Ookueyama, Kitagawa Town, Nobeoka City, Miyazaki Prefecture, Japan. Chigaku Kenkyu, 60 (1), 25-31. [Fergusonite-(Y)] STEPANOV, A.V., BEKENOVA, G.K., LEVIN, V.L., HAWTHORNE, F.C. & DOBROVOL’SKAYA, E.A. (2012): Tarbagataite,(K,□)2(Ca,Na)(Fe2+,Mn)7Ti2(Si4O12)2O2(OH)4(OH,F), a new astrophyllite-group mineral species from the Verkhnee Espe deposit, Akjailyautas Mountains, Kazakhstan: description and crystal structure Canadian Mineralogist 50,159-168. [Fergusonite-(Y)] Knut Edvard Larsen collection # MM- 3943, Visual identification by F. Pezzottta may 2007. [Fergusonite-(Y)] Cairncross, B., Messner, K & Farquharson, E. (1999): Die Pegmatite des Mount Malosa bei Zomba, Malawi. LAPIS 24 (4), 22-32; Cairncross, B. (2002). Aegirine and Associated Minerals from Mount Malosa, Malawi. Rocks & Minerals, 77(1), 31-37. [Fergusonite-(Y)] Prol-Ledesma, R.-M., Melgarejo, J.C. & Martin, R.F. (2012) The El Muerto "NYF" granitic pegmatite, Oaxaca, Mexico, and its striking enrichment in allanite-(Ce) and monazite-(Ce). Canadian Mineralogist 50, 1055-1076. [Fergusonite-(Y)] Kartashov P.M., Voloshin A.V., PakhomovskiiYa.A. On the zonal crystaline gadolinite from the alkaline granite pegmatites of Haldzan Buragtag (Mongolian Altai), - Zapiski VMO, 1993,N3,p. 65-79. [Fergusonite-(Ce)] Macdonald R., Baginski B., Kartashov P., Zozulia D., Dzierzanowski P. Interaction of rare-metal minerals with hydrothermal fluids; evidence from quartz-epidote metasomatites of the Haldzan Buragtag massif, Mongolian Altai, - Can. Miner., 2015. v.53, pp. 1015-1034. 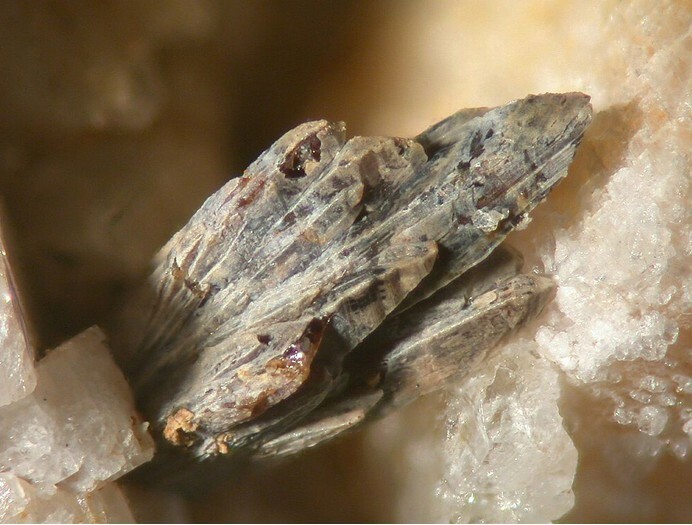 [Fergusonite-(Y)] Dias, M. Bettencourt and Wilson, W. E., 2000, Mineralogical Record, 31:459-497. Watters, W.A., Todd, H.J., Sixtus, E.J. (1961) Fergusonite and samarskite from Canaan, Pikikiruna Range, Nelson. New Zealand Journal of Geology and Geophysics, 4:3, 270-273. [Fergusonite-(Y)] Frigstad, O.F. (1968): En undersøkelse av cleavelandittsonerte pegmatittganger i Iveland-Evje, Nedre Setesdal. Hovedfagsoppgave (Thesis), University of Oslo. [Fergusonite-(Y)] Stensrud, S. (2009): De opptredende mineraler på granittpegmatittganger i Iveland og Evje. Unpublished paper based on 4 previous papers written together with Johan Løchen. [Fergusonite-(Y)] Stensrud, S. (2009) De opptredende mineraler på granittpegmatittganger i Iveland og Evje. Unpublished paper based on 4 previous papers written together with Johan Løchen. ⓘ Frøyså 15 Feldspar Prospect ? ⓘ Ljosland 04 (Thortveitittgruva) ? [Fergusonite-(Y)] Lund, M. (2016) Columbite-tantalite and garnet geochemistry in Evje-Iveland, south Norway. master Thesis in Geosciences, University of Oslo. 156p. [Fergusonite-(Y)] Husdal, T. (2008): The minerals of the pegmatites within the Tysfjord granite, northern Norway. Norsk Bergverksmuseum, skrift 38, 5-28. [Fergusonite-(Y)] Bjørlykke, H. (1939): Feltspat V. De sjeldne mineraler på de norske granittiske pegmatittganger. Norges Geologiske Undersøkelse. 154. 77p. 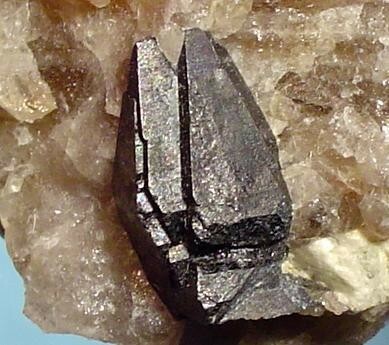 [Fergusonite-(Y)] Larsen, A.O., Škoda, R., Åsheim, A. (2016): Yttrian epidote and allanite-(Y) from a granite pegmatite in Bamble, Telemark, Norway. Norsk mineralsymposium 2016, 33-38. [Fergusonite-(Y)] Raade et al(1993): Kuliokite-(Y) and its alteration products kainosite-(Y) and kamphaugite-(Y) from granite pegmatite in Tørdal, Norway, European Journal of Mineralogy: 5: 691-698. [Fergusonite-(Y)] Åmli,R. (1974): Rapport, Mineralogisk-Geologisk Museum. Mineralogiske og geokjemiske undersøkelser vedrørende scandium, niob og sjeldne jordarter i Fensfeltet, Ulefoss( p. 49) Cited in Neumann, H. (1985): Norges Mineraler. Norges Geologiske Undersøkelse Skrifter 68, p. 83). Norges Geologiske Undersøkelse (NGU) Ore Dateabase: Sæteråsen Deposit no. 6 in Larvik (0709) municipality. [Fergusonite-(Y)] Matyszczak, W. (2018). Liandratite from Karkonosze pegmatites, Sudetes, Southwestern Poland. Mineralogy and Petrology, 1-14. [Fergusonite-(Y)] Szakáll, S. & Kristály, F., Eds. (2010): Mineralogy of Székelyland, Eastern Transylvania, Romania. Csík County Nature and Conservation Society, Miercurea-Ciuc, Romania, 321 pp. [Fergusonite-(Ce)] Koneva A.A., Konev A.A., Vladykin N.V. (2010) Vein complex of the Biraya carbonatite deposit. in Abstracts of XXVII International conference School «Geochemistry of Alkaline rocks». – Moscow-Koktebel’. pp. 240 pp. [Fergusonite-(Y)] Voloshin, A.V., Lyalina, L.M., Savchenko, Ye.E., Selivanova, E.A. [Волошин А.В., Лялина Л.М., Савченко Е.Э., Селиванова Е.А.] (2005): Intragranite rare-metal pegmatites of the alkaline granite formation of the Kola Peninsula. Quartz-zircon pseudomorphs [Внутригранитные редкометалльные пегматиты щелочногранитовой формации Кольского полуострова. Кварц-цирконовые псевдоморфозы]. Zapiski RMO [Записки РМО], 134, 4, 98-107; Lyalina, L.M., Selivanova, E.A., Savchenko, Ye.E., Zozulya, D.R., Kadyrova, G.I. (2014): Minerals of the gadolinite-(Y)–hingganite-(Y) series in the alkali granite pegmatites of the Kola Peninsula. Geology of Ore Deposits, 56, 675-684. [Fergusonite-(Y)] Voloshin A.V., Pakhomovskii Ya.A. [Волошин А. В., Пахомовский Я. А.] (1986): Minerals and evolution of mineral formation in amazonite pegmatites of the Kola Peninsula [Минералы и эволюция минералообразования в амазонитовых пегматитах Кольского полуострова]. Nauka, Leningrad, 168 pp. (in Russian). [Fergusonite-(Y)] Savel'eva V.B. Karmanov N.S. (2008) Rare earth's minerals of alkaline metasomatites of Main Sayan Fault zone, - Zapiski RMO, N2, pp.14-35 (in Rus.). ; Savel’eva, V.B., and Karmanov, N.S. (2008): Geology of Ore Deposits 50(8), 681-696. [Fergusonite-(Y)] Bertossa, A. (1968) Inventaire des minéraux du Rwanda. Bulletin du Service Géologique de Rwanda: 4: 25-45.; Daltry, V.D.C. and von Knorring, O. (1998) Type-mineralogy of Rwanda with particular reference to the Buranga pegmatite. Geologica Belgica: 1: 9-15. [Fergusonite-(Y)] Küster, D. (2009): Ore Geology Reviews 35, 68-86.; Atencio, D., Bastos Neto, A.C., Pereira, V.P., Ferron, J.T.M.M., Hoshino, M., Moriyama, T., Watanabe, Y., Miyawaki, R., Coutinho, J.M.V., Andrade, M.B., Domanik, K., Chukanov, N.V., Momma, K., Hirano, H., Tsunematsu, M. (2015): Waimirite-(Y), orthorhombic YF3, a new mineral from the Pitinga mine, Presidente Figueiredo, Amazonas, Brazil and from Jabal Tawlah, Saudi Arabia: description and crystal structure. Mineralogical Magazine, 79, 767-780. [Fergusonite-(Ce)] R. Liferovich - L. Horváth p.c. (2004); Mitchell, R. H., & Liferovich, R. P. (2006). Subsolidus deuteric/hydrothermal alteration of eudialyte in lujavrite from the Pilansberg alkaline complex, South Africa. Lithos, 91(1), 352-372.
ⓘ Mbabane (Embabaan District) ? [Fergusonite-(Y)] Kjellman et al. 1999, Canadian Mineralogist vol.37, 832-3. Langhof, J. (1991): REE-mineralogi i Mo-förande granitpegmatiter i Vetlandatrakten, Småland. Examensarbete 20 p i mineralogi-petrologi, Institutionen för geologi och geokemi, Stockholms Universitet, Stockholm SI: 1-37. [Fergusonite-(Y)] Wedding, B. (1989) Magmatic garnets in the Blomskog pegmatite, southwestern Sweden. Geologiska Föreningen i Stockholm Förhandlingar. 111: 149-153. [Fergusonite-(Y)] Stalder, H. A., Wagner, A., Graeser, S. and Stuker, P. (1998): "Mineralienlexikon der Schweiz", Wepf (Basel), p. 161. Inst. Geol. Sci. Ann. Rept. for 1974, 91-2 (1975). ; Livingstone, A. and Macpherson, H.G. (1983) Fifth supplementary list of British minerals (Scottish). Mineralogical Magazine, vol. 47, n° 342, p. 99-105. [Fergusonite-(Ce)] Trudy Min.Muz. Fersmana (1976) 25, 166-172. Heinrich, E. Wm. (1960), AZ Bur. of Mines Bull. 167: 12-18; Anthony, J.W., et al (1995), Mineralogy of Arizona, 3rd.ed. : 219; Meeves, H., et al (1966), Reconnaissance of beryllium-bearing pegmatite deposits in six western states, US Bur. Mines Info. Circ. 8298: 21 (Table A-1). ; Brown, TJ, "Geology & Geochemistry of the Kingman Feldspar, Rare Metals and Wagon Bow Pegmatites" (2010). University of New Orleans Theses and Dissertations. Paper 1280. Anthony, J.W., et al (1995), Mineralogy of Arizona, 3rd.ed. 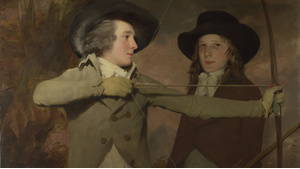 : 219; Galbraith, F.W. & Brennan (1959), Minerals of AZ: 40. Murdoch, Joseph & Robert W. Webb (1966), Minerals of California, Centennial Volume (1866-1966): California Division Mines & Geology Bulletin 189: 185. Hewett, Donnel Foster, Stone, J., and Stieff, L.R. (1969) The ages of three uranium minerals, Mojave Desert, California. USGS Prof. Paper 650-B: 86; Pemberton, H. Earl (1983), Minerals of California; Van Nostrand Reinholt Press: 180. Pemberton, H. Earl (1983), Minerals of California; Van Nostrand Reinholt Press: 180, 319. [Fergusonite-(Y)] Minerals of Colorado (1997) Eckel, E. B.
American Mineralogist (1984): 67: 184.
ⓘ Biermann Quarries (Bethel quarries) and tourmaline ledge ? [Fergusonite-(Y)] King & Foord, 1994. Mineralogy of Maine, V. 1.; King and Foord, 2000, Addenda to Volume 1, Mineralogy of Maine, v. 2. US Dept. of Int. Bur. of Mines ROI #6885 (1967):13. Jahns, R. H., (1946) Mica Deposits of the Petaca District, Rio Arriba County, New Mexico, with Brief Descriptions of the Ojo Caliente District, Rio Arriba County, and the Elk Mountain District, San Miguel County. NMBMGR Bulletin 25. [Fergusonite-(Y)] M.V. Lupulescu, J.D. Price, and J.R. Chiaranzelli (2011) The 38th Rochester Mineralogical Symposium, April 14-17, 2011, lecture abstracts, page 24-25. Crook, Wilson W. III (1977) Texasite, a new mineral: the first example of a differentiated rare-earth species. American Mineralogist: 62: 1006-1008.; Rocks & Minerals (1991) 66(3): 196-224. [Fergusonite-(Y)] Arthur Smith, Frank Roberts, Denise Bicknell (2008) Mineral News, 24, #1, 6-7. Minerals of Virginia, 1990 by R. V. Dietrich; Arthur A. Pegau (1932) Pegmatite Deposits of Virginia. Virginia Geological Survey; Bulletin 33.
ⓘ Many Values pegmatite prospect ?